Is the pirates life for you? Well then, flag ahoy! 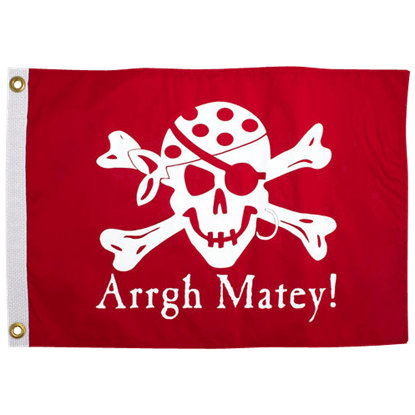 Our Arrgh Matey Pirate Flag is an utterly piratey decoration that is perfect for use in your home, on your deck, or atop your ships mast! Want to show your pirate pride? Buy this! One of the most infamous pirates on the Caribbean Sea and the Atlantic Ocean, Bartholomew Roberts, also called Black Bart, was the captain of the Royal Fortune. 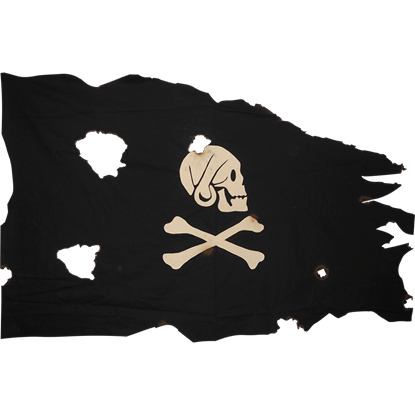 His first standard can be seen on the Bartholomew Roberts Pirate Flag. 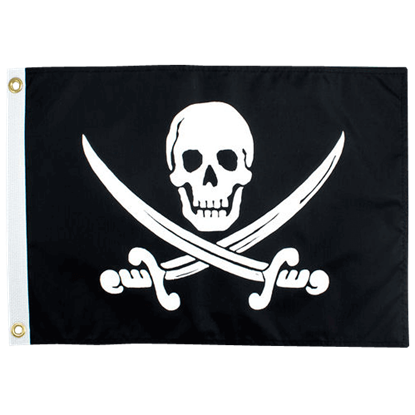 Calico Jack was such a famous pirate captain that, three hundred years later, his emblem is still one of the most iconic Jolly Rogers. 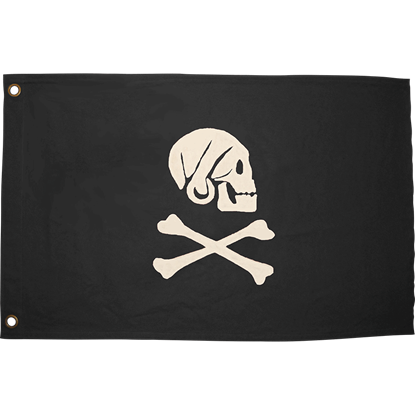 With the Battle Worn Small Calico Jack Flag, you can have your own handmade version of this symbol. Pirates represent adventure on the high seas, and few were quite as adventurous as the legendary Henry Avery. 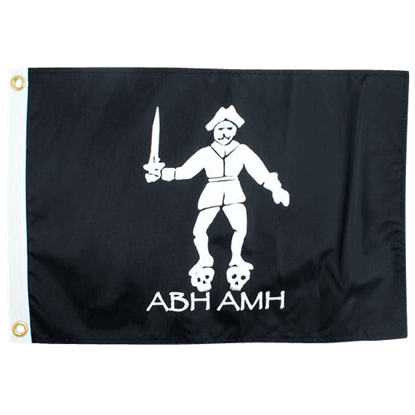 Raise the Jolly Roger of the one and only King Pirate practically anywhere with the Battle Worn Small Henry Avery Flag. 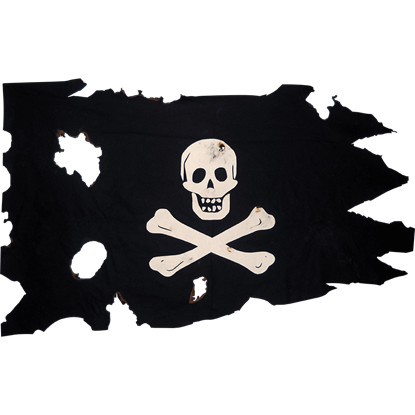 With the Battle Worn Small Jolly Roger Flag, your superior prowess as a land raiding and cutlass wielding buccaneer can be shown anywhere! The convenient size of this flag allows you to easily display it in your home or office. The pirate known as Bartholomew, or Black Bart, Roberts was infamous for his grudge against the Barbadians and the Martiniquians. 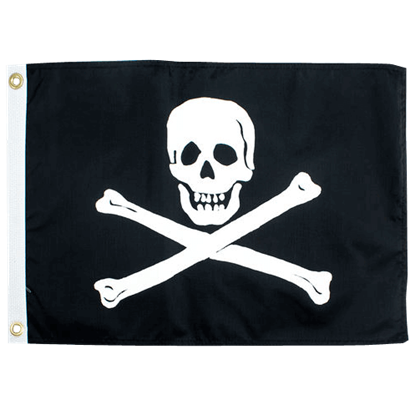 He hated them so much, he made a flag, the Black Bart Pirate Flag, to advertise his enmity to them. Perhaps the most feared pirate on the seven seas, Edward Teach, also known as Blackbeard, used fear and intimidation as weapons. 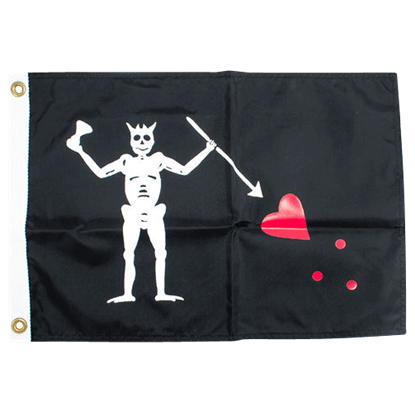 Fly the Blackbeard Pirate Flag and use the fear of your enemies as a weapon to get your booty! Called Calico Jack because of the fabric his clothing was made from, John Rackham is one of the most famous pirates from the Golden Age of Piracy. 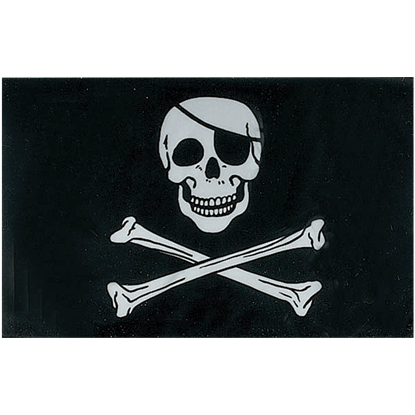 His standard, seen on the Calico Jack Rackham Pirate Flag, is a type of Jolly Roger! 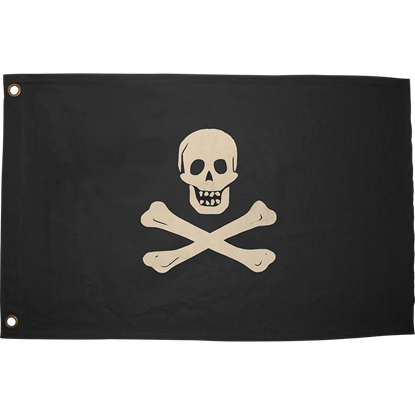 Every merchant on the Seven Seas knows that the ships bearing the black flag with the skull and crossbones spell certain death. With the Eyepatch Jolly Roger, you can emulate the pirates of old and become a truly fearsome buccaneer. 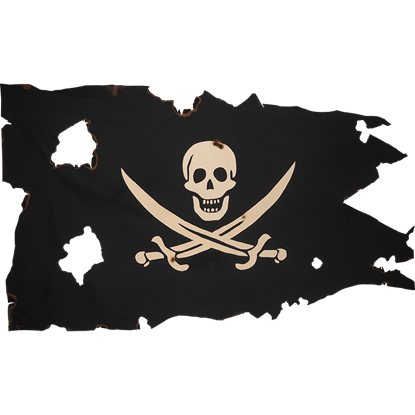 Quite possibly the most famous of all the pirate flags, the Jolly Roger, as seen in the Jolly Roger Pirate Flag, has been flown by many pirate captains, including Edward England! Now you, too, can fly this iconic flag in your home! The Arch Pirate Henry Avery was undoubtedly the most successful pirate of the late 17th century. The Medium Henry Avery Flag showcases his iconic emblem, adding a handmade touch from the Golden Age of Piracy to your home decor. The skull and crossbones, known as the Jolly Roger, has been an iconic symbol since the early 1700s, or the Golden Age of Piracy. 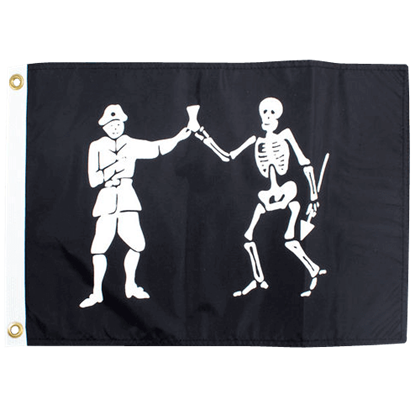 Now, you can fly your very own handmade Jolly Roger anywhere with the Medium Jolly Roger Flag.